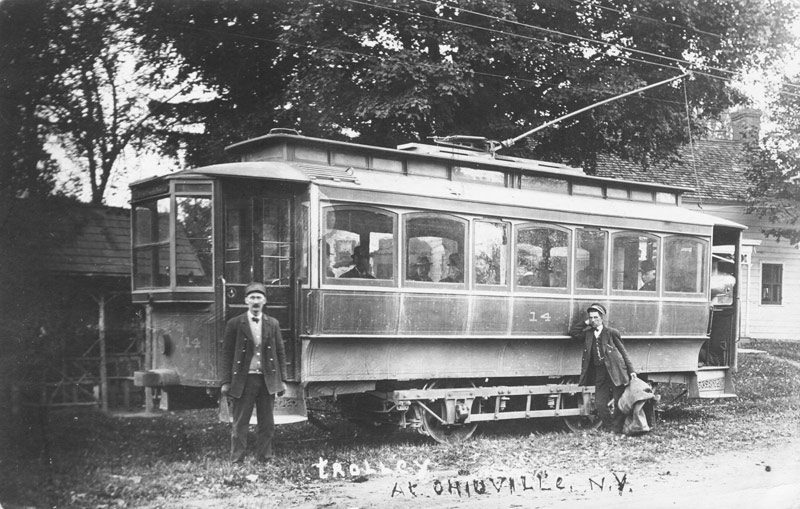 New Paltz & Poughkeepsie Traction Co. Trolley #14 at Ohioville with William Whitmore (L) and Homer Freer. Art evokes feeling. For many of us, trolley images from early last century do just that. They beckon us to imagine riding on them. To think about how they changed the places and people they connected. Now, the Town of Lloyd Historical Preservation Society, whose mission is, in part, to collect and preserve the historic heritage of the town, has chosen street art as a “vehicle” to accomplish that mission. They have chosen the trolley to “carry us back.” Artists and sponsors for sidewalk trolleys can get more information for this project by going to TOLHPS.org. 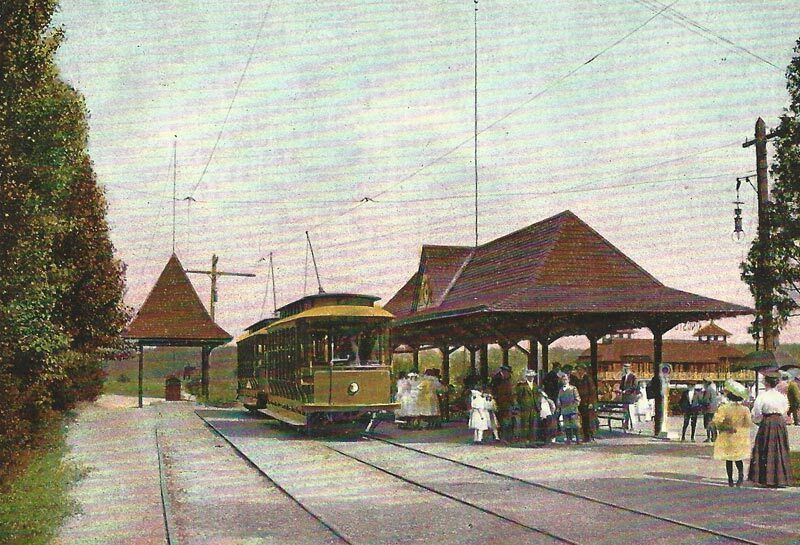 Ulster County’s only inter-city trolley line ran from the boat landing and West Shore Rail Road station at the Hudson River in Highland to the Wallkill River in New Paltz. A connecting trolley was pulled across the Poughkeepsie Railroad Bridge (now Walkway Over The Hudson) by a small locomotive. It met the main trolley at Pratt’s Mills, Highland, where passengers could complete or continue their trip. In effect, this was also the only inter-county trolley in the Hudson Valley. Almost every city of any size had a trolley line. Predating the affordability of personal automobiles, trolley lines sprang up in the late 1800s and early 1900s making it possible to live away from where you worked, shopped, or attended school. Photo dated 1904. Paving at the intersection of Main Street and Vineyard Avenue, Highland. Image thanks to the Town of Lloyd Historian’s Office. The New Paltz to Highland trolley route was laid out along the New Paltz Turnpike, a private toll road at the time. It followed what is now Old New Paltz Road. The new trolley company paid $17,500.00 for the Turnpike Co. stock and promised to continue it as a turnpike. Ninety thousand dollars of capital stock was to be sold at $100 per share to provide the money for building the line, purchasing ties, erecting the overhead power lines, constructing and equipping the powerhouse, and purchasing the moving stock. The electric power was supplied at Loyd, now Highland Fire Station #2, near the intersection of Old New Paltz Road and Route 299. This was convenient as fuel for the electric power station could be delivered by trains that passed just to the south of the powerhouse. 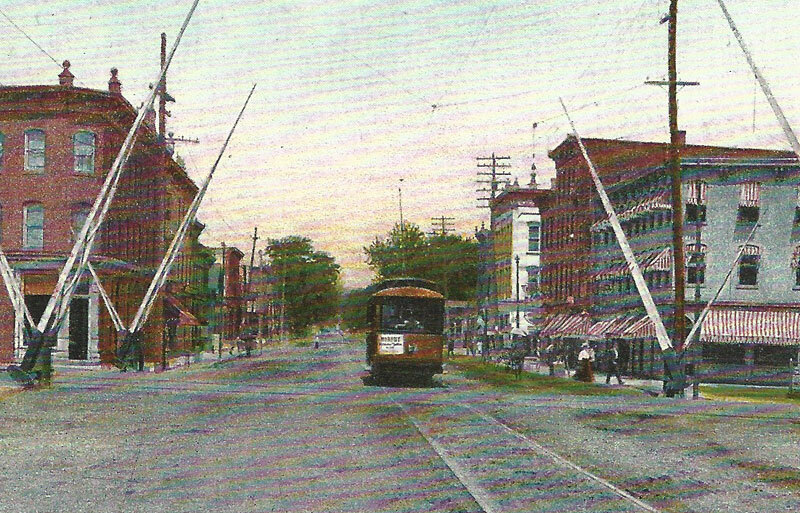 The trolley line improved the economic and social life for almost everyone in Lloyd and New Paltz and those living along its route. It also brought tourists who, after disembarking from the West Shore Railroad or the steamships docked in Highland, would board the trolley and stop along the line at businesses, boarding houses, casinos, churches, and schools, or make connections to go to the Shawangunk mountain resorts west of New Paltz. Postcard, Circa 1907, showing the carriages awaiting the train or trolley. Carriages would take passengers to the Mohonk or Minnewaska Mountain Houses. 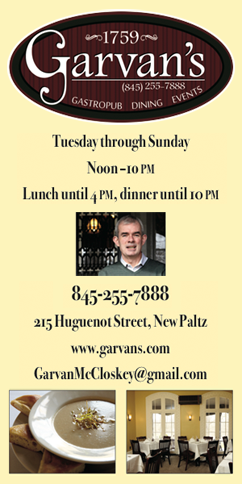 Today, the station is La Stazion Restaurant at the lower part of Main Street, New Paltz. 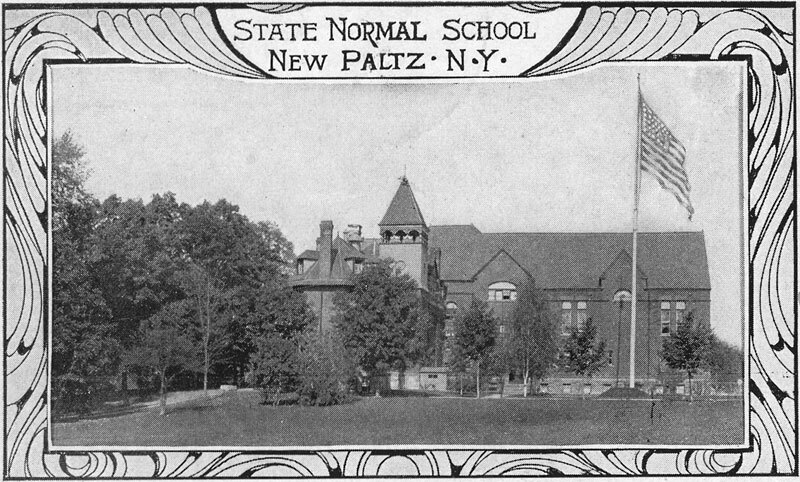 Post Card image: New Paltz Normal School prior to 1906 fire. “New” Normal School, now “Old Main” on SUNY Campus. Note the tennis courts lower left. 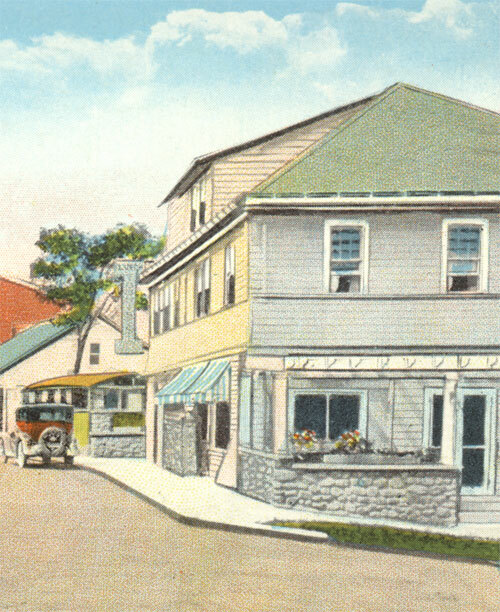 Once at New Paltz, a traveler could connect to the Wallkill Valley rail line or take the carriages up to the Mohonk and Minnewaska resorts or stay to visit The Casino, a seasonal dance hall, that became the Blue Crane Inn, and today is P&G’s Restaurant. The Casino. Now P&G’s Resaurant, corner of Main & North Front Streets, New Paltz. 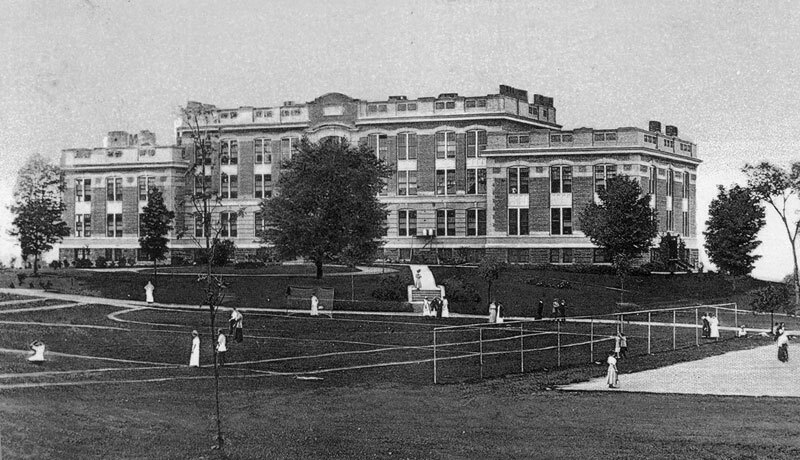 Circa 1908. Postcard detail, circa 1930 shows what was originally the Casino (not a gambling establishment) then the Blue Crane Inn, a few identities of the hospitality businesses before P&G’s. From Pratt’s Mills in Highland you could take the “bud” (small) trolley car from Pratt’s Mills in Highland to Poughkeepsie and proceed by another trolley to the station at the Hudson River Psychiatric Center to visit or work, or to patronize the businesses along main thoroughfares of the city. Land along the trolley’s path became quite valuable. Boarding houses and other businesses sprung up. People were traveling to and from jobs and classrooms. The line expanded the horizons not only along its own route but to all the connecting transportation along the Hudson River and the Wallkill River basin. 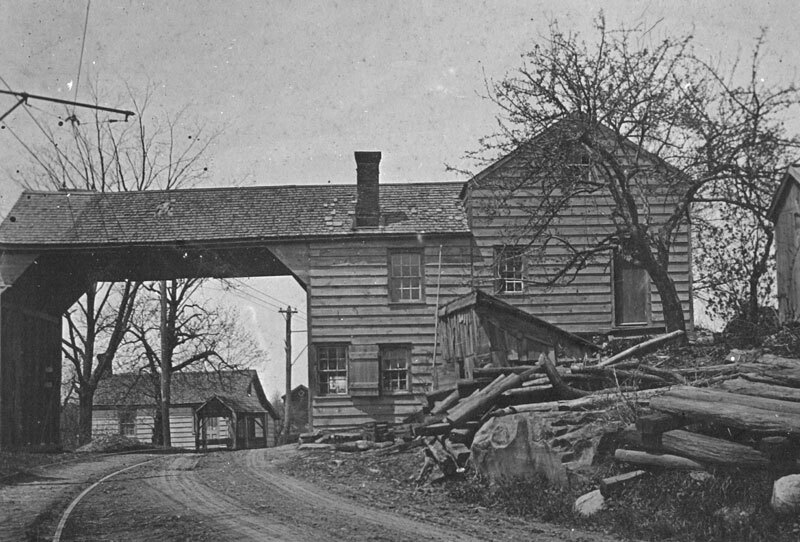 New Paltz-Highland turnpike toll house with trolley tracks on New Paltz Road, circa 1890s. Four companies owned the trolley line during its existence. 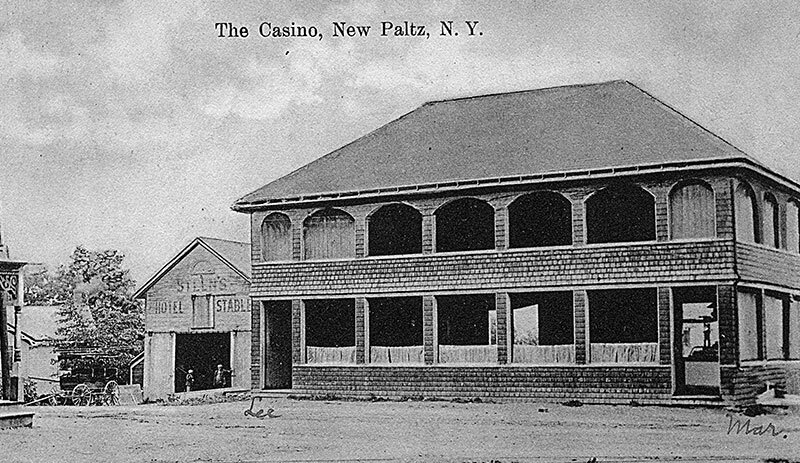 The New Paltz and Highland Electric Railroad was the first owner from 1893 to 1897. 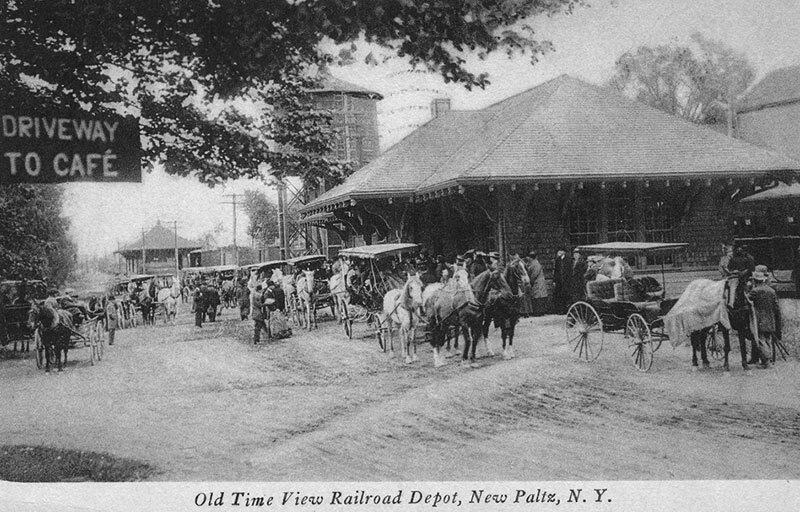 The New Paltz and Wallkill Valley Railroad was the second from 1897 to 1900. 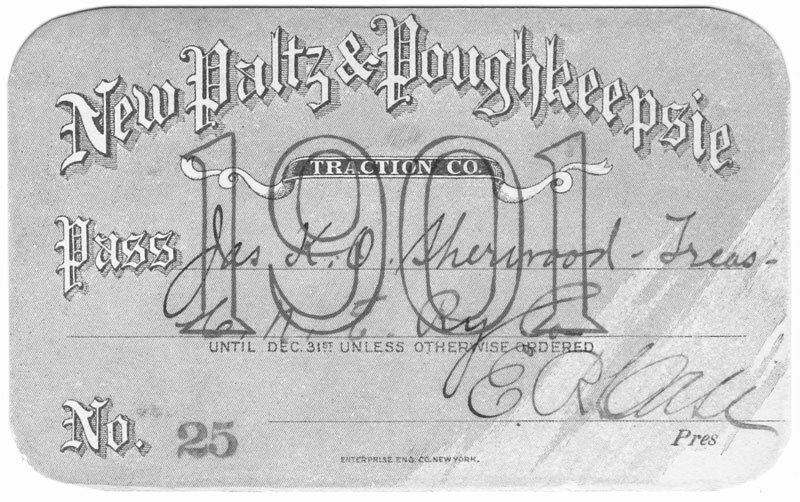 Third was the New Paltz and Poughkeepsie Traction Company from 1900 to 1903 (image of trolley pass below). Last was the New Paltz, Highland, and Poughkeepsie Traction Company from 1903 until 1925, most of the line’s existence. No trolley actually ran on the line until after 1897 even though initial plans had been made in 1893. Early in its life the trolley line was successful because the competition from buses and automobiles was rare, roads were poor or non-existent, and the Mid-Hudson Bridge was not open until 1930. Additionally, the ferry between Highland and Poughkeepsie could not run in the winter. Trolley cars would leave New Paltz and Highland every hour with a fifty-minute running time. The fare was 25 cents. US Mail distribution was also a money-maker for the line, as was transporting milk and other fresh products. A number of accidents on the line, unfortunately, resulted in passenger injury suits which kept the fortunes of the trolley line low. 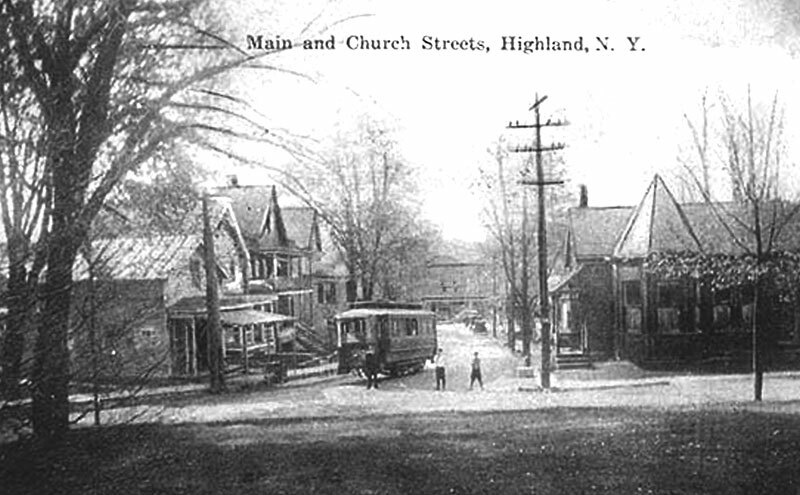 The Highland to New Paltz trolley at the intersection of Main and Church streets in Highland. Postcard is circa 1909. It is not difficult to imagine the property values along the line increasing as locals recognized the potential of becoming summer boardinghouse proprietors. By 1925 the trolley line was overtaken by the increase in personal wealth allowing even the modestly wealthy to afford cars. Roads improved, bridges were built and the Highland-New Paltz trolley line ceased operation. 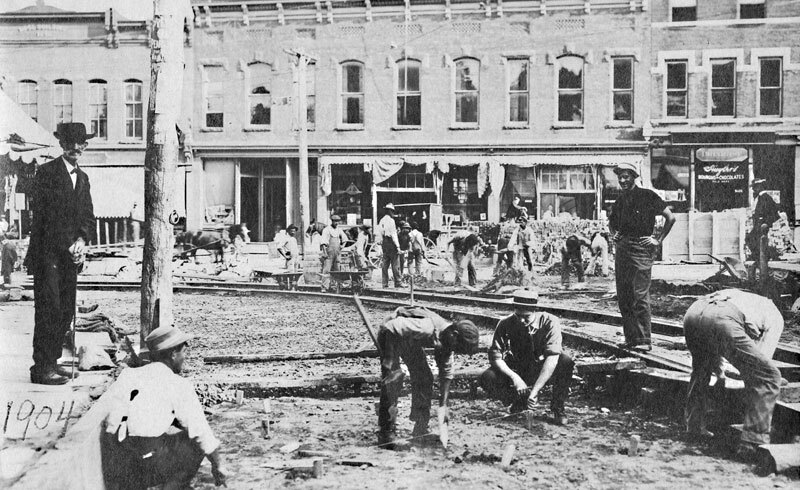 Every now and again, the trolley line reminds us of its past glory when tracks peek through the paving on some streets or roads in New Paltz and Highland. The Town of Lloyd Historical Preservation Society wants to remind us of its trolley line’s past glory, too. See “Trolley Street Art Project” below. Go ahead, sponsor or design a trolley. Get onboard. Except where noted, the images for this article are from the collection of Vivian Yess Wadlin. 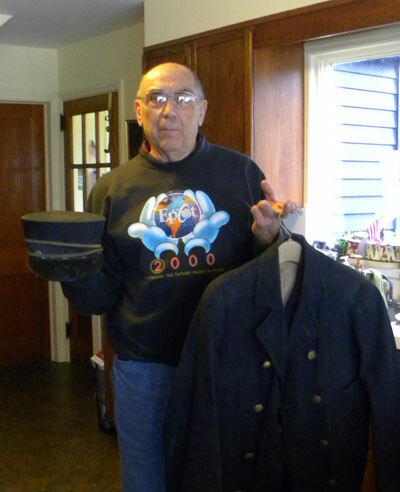 Lloyd Historical Preservation Society member, Jack Auchmoody, holds the hat and uniform his father wore when he was a conductor on the New Paltz-Highland trolley. Jack has donated the items and the Society has preserved them for future display. He also gave the conductor’s whistle. Thank you, Jack! 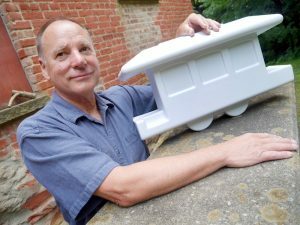 The street art trolley’s playful design is by Jim Fawcett of Highland. The mold for it was produced by Niekamp Tool Co, in Kingston. Each trolley is manufactured by USHECO of Kingston using vacuum molding of plastic. Trolleys are available for “adoption” and sponsored by a business, individual, or group. The sponsor pays to have the trolley produced. Sponsors can have their own design, or choose from among designs offered by area artists. Artists submit an application with their design ideas on paper and if the design is chosen by a sponsor, the artists is given the trolley blank, $50 for materials, and a contract and copyright release to sign. When completed, the trolleys are professionally clear-coated to help weatherproof them and erected in designated places in the Town of Lloyd (Highland) where they are likely to be viewed. Each trolley will have a plaque with the sponsor’s and artist’s information. After the trolleys have been “on the street” for three-four months, they are sold at a benefit auction. Artists receive 25% of the money raised by their trolley. Trolleys will be auctioned at a benefit party that will be free for sponsors and artists. The Lloyd Historical Society website, TOLHPS.org, has downloadable artist and sponsor agreements, details, and timeline.